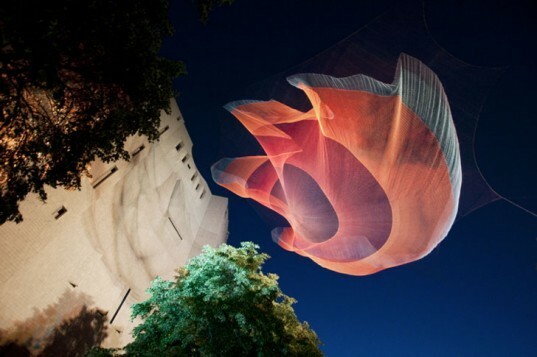 Janet Echelman creates incredible hovering string sculptures by using traditional net-weaving techniques to transform simple spools of thread. Her beautiful sculptural installations are often strung between buildings and poles, resembling the aurora borealis when light at night. 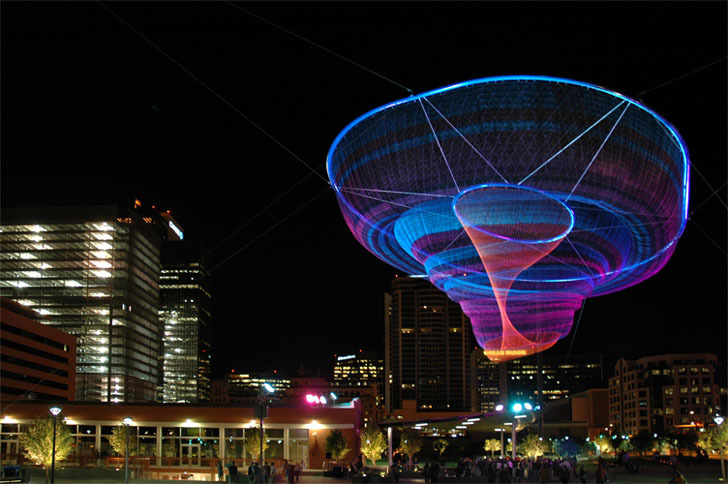 The luminous net sculptures have been found hovering around the world, adding a surreal color to the night sky. Echelman first conceived of her elaborate net sculptures during her Fulbright lectureship in India, where she learned net weaving from the local fisherman of the Mahaballipuram region. She has used her inspiration from these fisherman to create indoor and outdoor public installations from similar netting, which is hand-woven or machine-woven depending on the project. To create her complex designs, Echelman works with a team of aeronautical and mechanical engineers, amongst other design professionals. When suspended in the air, the large-scale works take on a life of their own, interacting with wind, sunlight, and precipitation as if they were living beings. During the day, the sculptures woven from fine string reveal their delicate composition. At night this delicacy fades and the suspending forms appear solid, floating mid-air as if they were space ships, organic creatures, or thick pieces of luminous fabric waving in the air. Although several of Echelman’s pieces are permanent installations, the sculptures can be moved easily, producing minimal waste, and no impact to the environments which they occupy. Janet Echelman recently gave a talk at TED 2011 on “Taking Imagination Seriously.” She is working on new pieces for the University of Oregon and Philadelphia’s City Hall. The Denver Art Museum's installation is my favorite of her string sculptures. It looks spectacular!! I have seen similar events but with lasers - this looks a little more appealing though!!! Echelman first conceived of her elaborate net sculptures during her Fulbright lectureship in India, where she learned net weaving from the local fisherman of the Mahaballipuram region. Inspired by these fisherman, she created indoor and outdoor public installations from similar netting, which is hand-woven or machine-woven depending on the project. When suspended in the air, the large-scale works take on a life of their own, interacting with wind, sunlight, and precipitation as if they were living beings. During the day, the sculptures woven from fine string reveal their delicate composition. At night this delicacy fades and the suspending forms appear solid, floating mid-air as if they were space ships, organic creatures, or thick pieces of luminous fabric waving in the air. Although several of Echelman's pieces are permanent installations, the sculptures can be moved easily, producing minimal waste, and no impact to the environments which they occupy.